The folks over at Generation Q Magazine have asked me for a favor and I’m happy to pass it on. Last month they launched the GenQ 2012 Addicted Stitcher Survey to gather all of those facts and numbers about us! Please take a few moments and answer the survey through the link below. The information gathered would help our wonderful industry people to support and create new products that we want. Oh, and there’s a bribe in it for you as well. 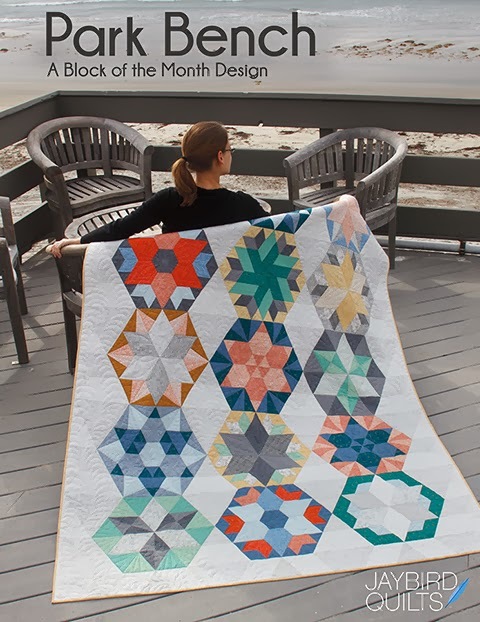 We last poked and probed into your fabricky lives in late 2011, with our GenQ Modern Quilters Survey. 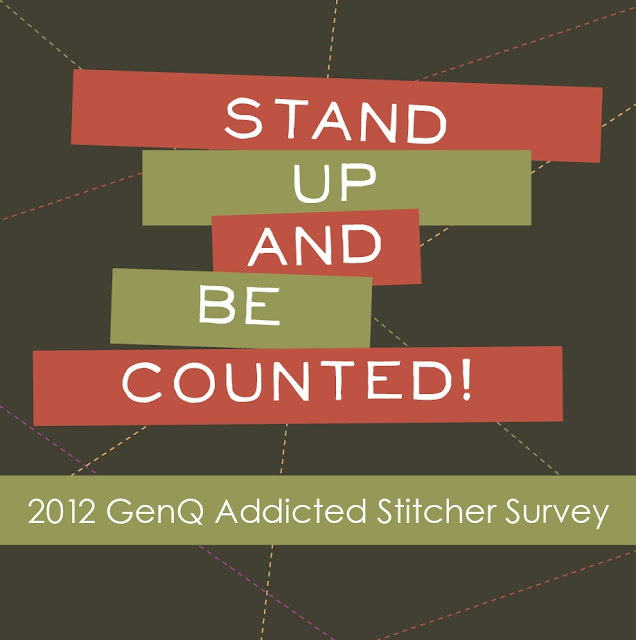 And now it’s time to do it again with the GenQ 2012 Addicted Stitcher Survey. (New name, same mission.) We’d like to count noses, pins, rotary cutters, whatever it takes to grab a detailed snapshot of this niche in the sewing and crafting world. Some of you have pained expressions, and you’re probably sighing with annoyance at yet another attempt for the corporate q-niverse to stick its demographic-hungry noses into stuff that just isn’t its business. 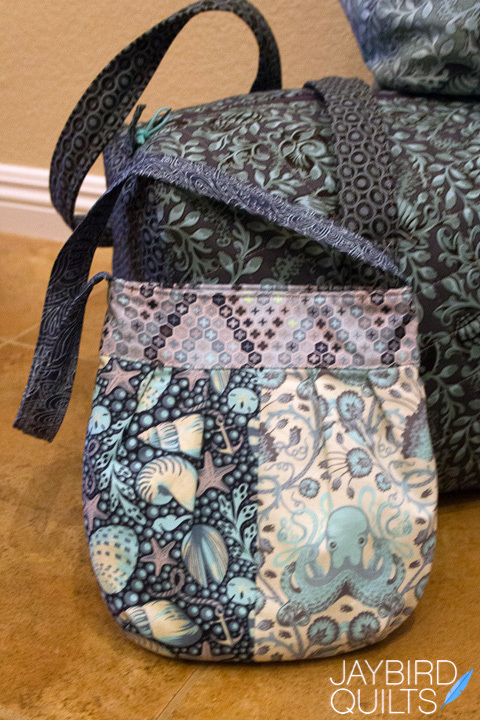 The truth is that all of us stitchy types thrive when our industry answers our needs. And that’s what this survey does. It helps to provide information to the industry so our needs, and wants, can be better met. Please take a few minutes to whip through the survey (it’s shorter this year) and tell us all about you. And there could be swag in it for you. 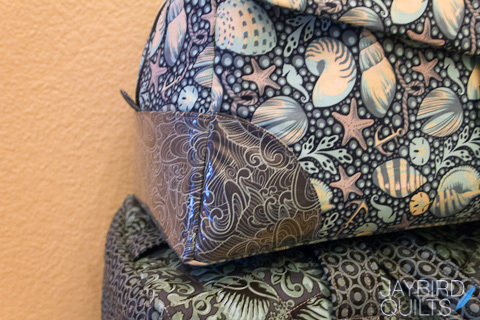 The survey will be live until the end of the December 2012, and on Jan. 1, 2013, we’ll choose FIVE lucky survey-takers who will each receive a box of fabric, books and small stitchy goodies valued at $50. 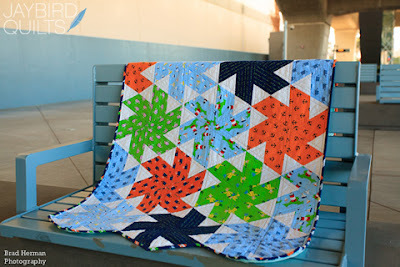 Just use this link to find your way to our 2012 Addicted Stitcher Survey. And please freely post it far and wide, encouraging your friends and sew-pals to also participate! Thank you so much for being a part of this second annual survey! And if you want to know more about what we do, check us out at GenerationQMagazine.com. 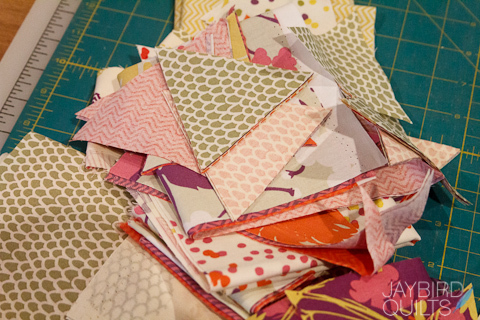 I haven't been doing much sewing lately, but I did just start working on my 4th Lotus quilt. 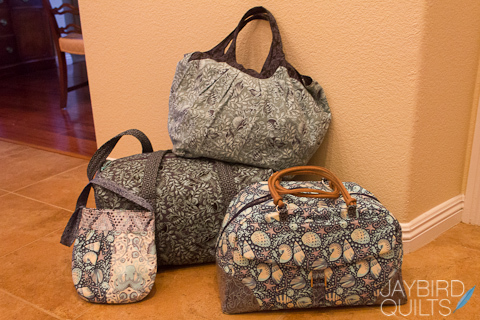 The fabric is called Piper and is a new line that Dear Stella just announced today. It'll be available in February. 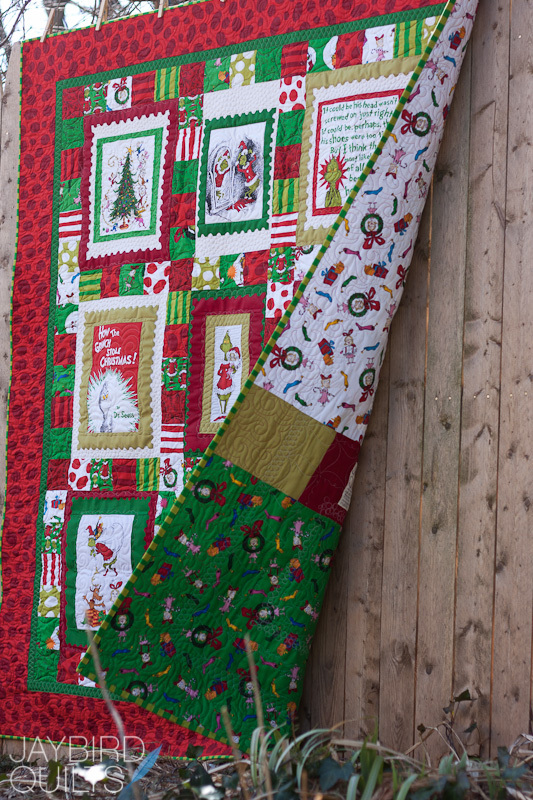 I have the first row done & almost all the blocks for the other rows made. I'm excited about how it is all coming together! 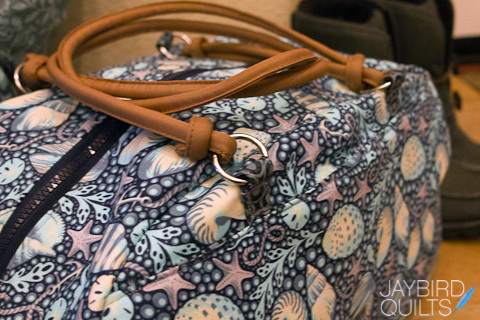 The fabrics are very saturated and pack a punch. 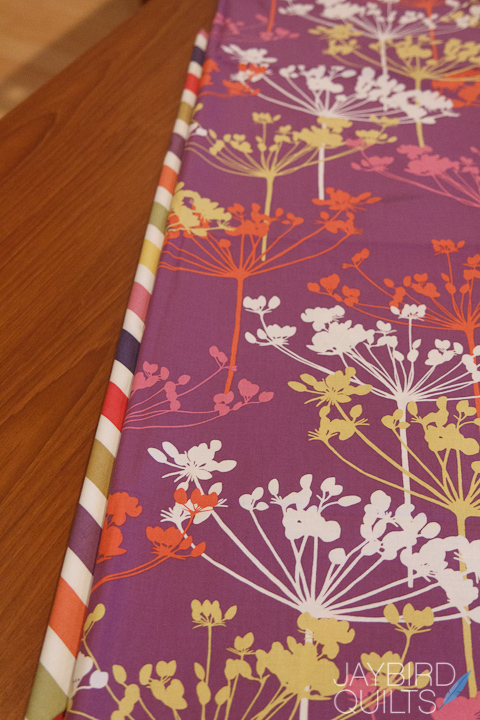 I chose to use the chunky strip as a bias binding and this big purple print for my backing. I'll share more photos as soon as I get it finished! We can control how we react. I know cancer better than I want to. 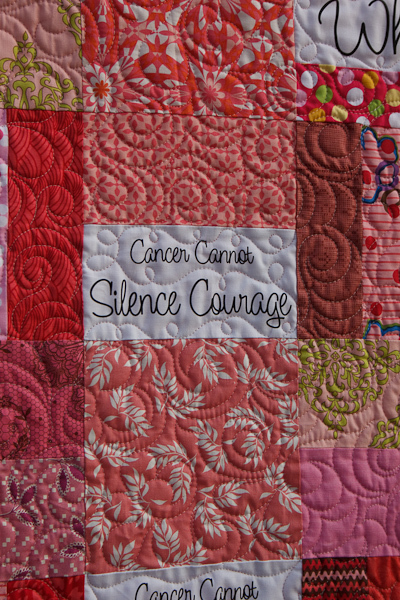 When Jeanne Coverdale was diagnosed with cancer she decided to design a quilt panel of what cancer cannot do. 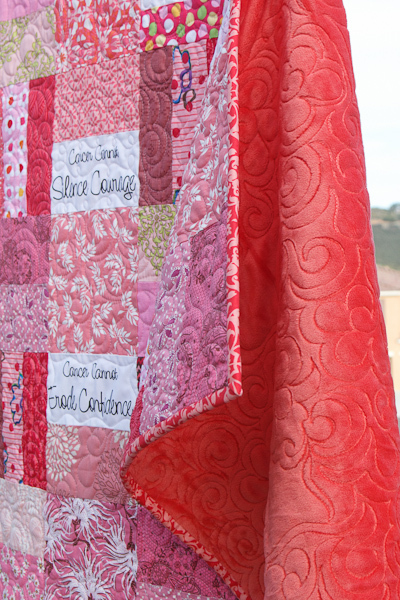 Jeanne unfortunately lost her battle last year, but her positivity lives on through her quilt designs. 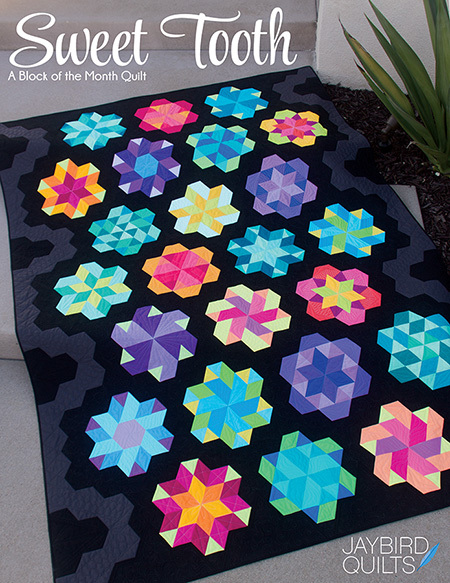 This quilt is for Gail. 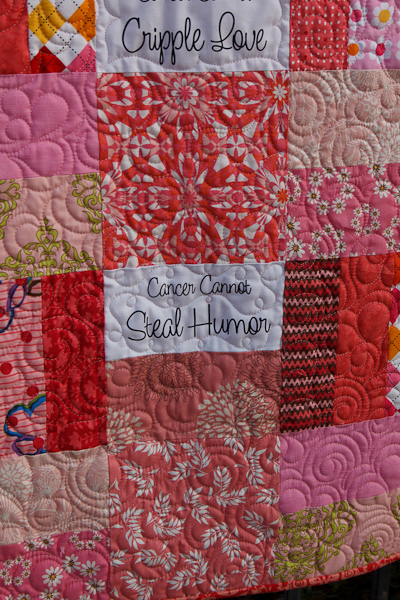 It is full of love, hugs & reminders of what cancer cannot do. 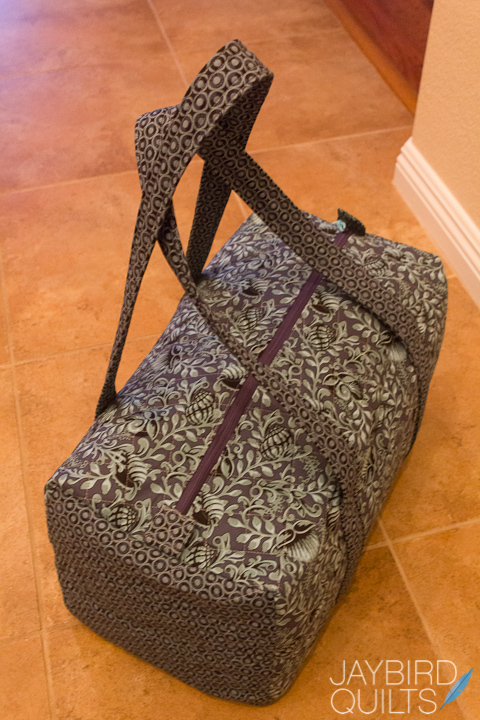 I used a cuddle fabric on the back. 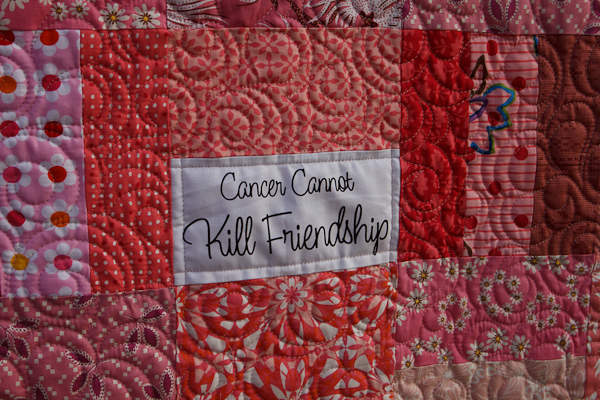 I've done this on all the quilts I make for those in treatment. 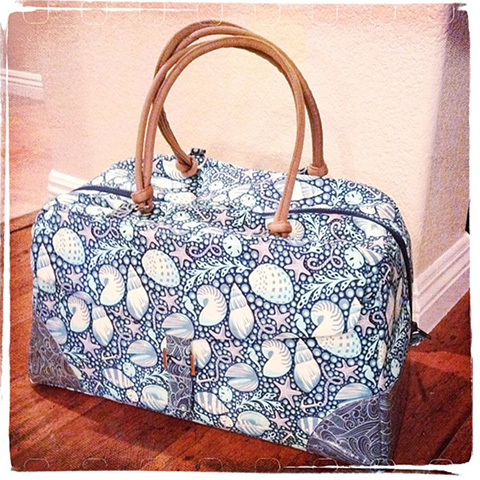 You can purchase the hand printed panel and download the free pattern at Block Party Studios. I have been getting a lot of questions about the Merry Grinchmas Pattern that was a free pattern I designed for Robert Kaufman almost two years ago. This post is to clear up any additional questions you may have. 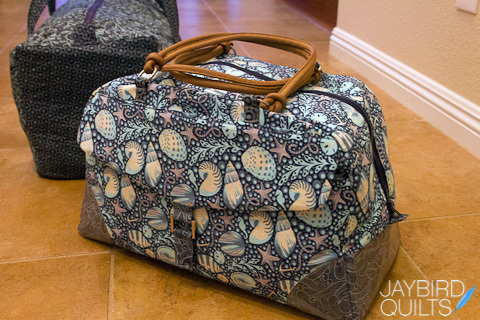 I appreciate your feedback and I do want to know when you find an error in my patterns. 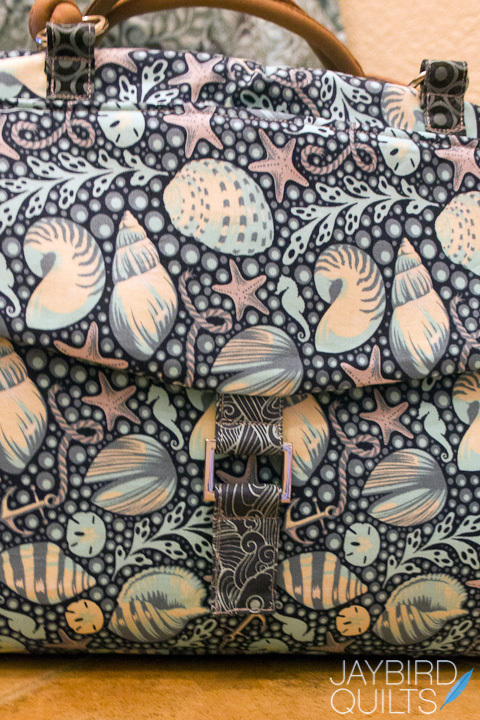 When the pattern was originally released there was one small mistake. 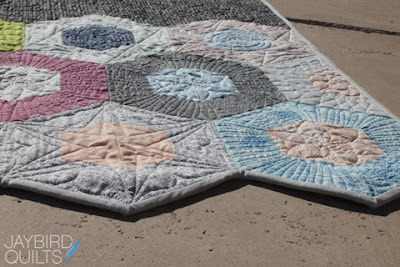 The finished size of 3" was listed for the setting squares, but the directions to cut them at 3 1/2" was accidentally omitted. 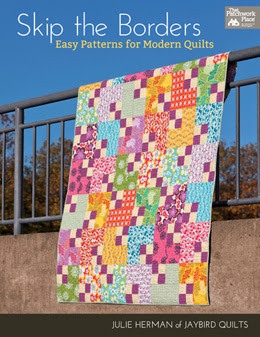 The error was quickly found and an updated pattern is available to download from Robert Kaufman's website. 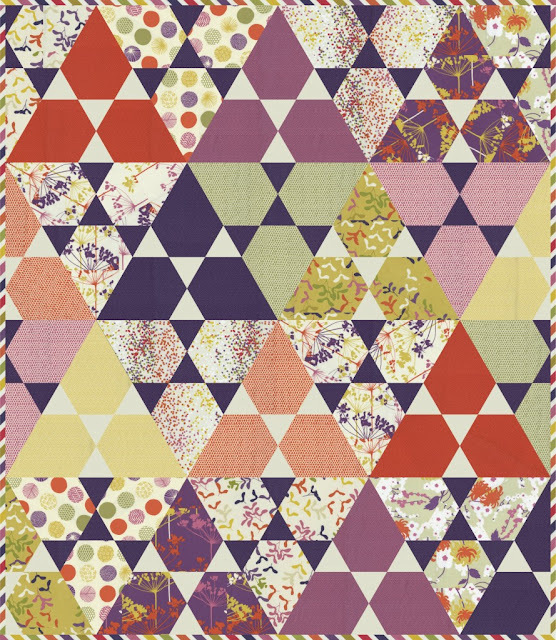 Please understand that while I do my best to assure that patterns are not released with mistakes sometimes things slip by unnoticed and have a correction posted later. 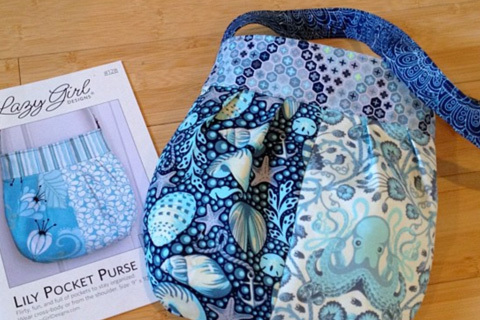 I have also received questions from people regarding the fabric they have in a kit. I personally did not make or sell any of the kits. 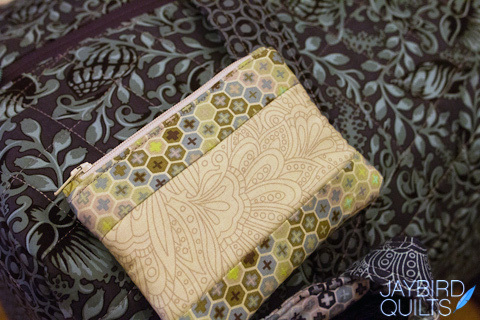 The pattern calls for Fat Eights of 12 fabrics. 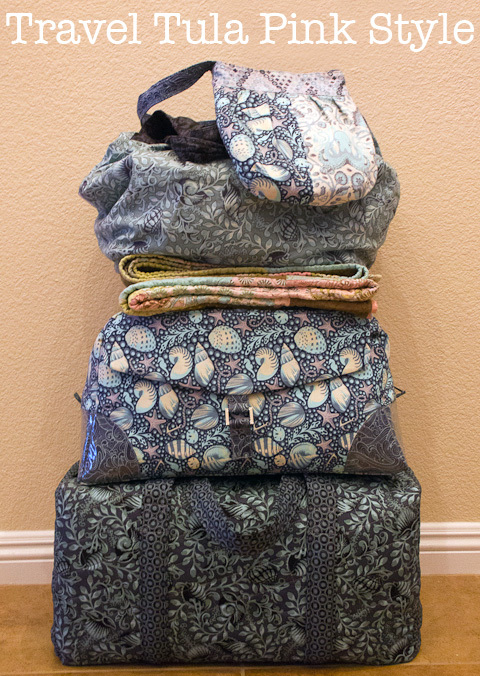 Two of those fabrics happen also be the outer border and binding fabrics. It is my understanding that in many of the kits, additional fabric of those prints were included vs. cutting separate Fat Eights. 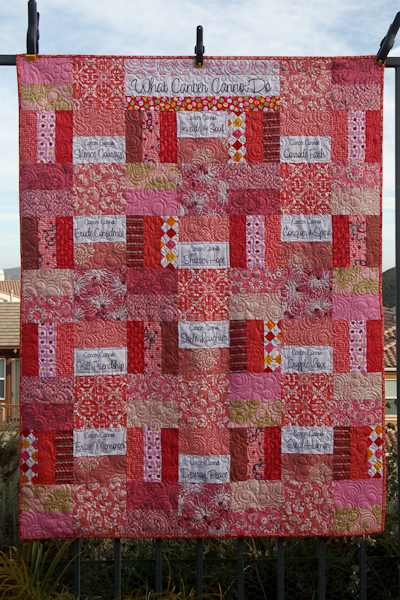 Another question has been why some blocks are appliqued onto the background and some blocks have the background added on top of the block. 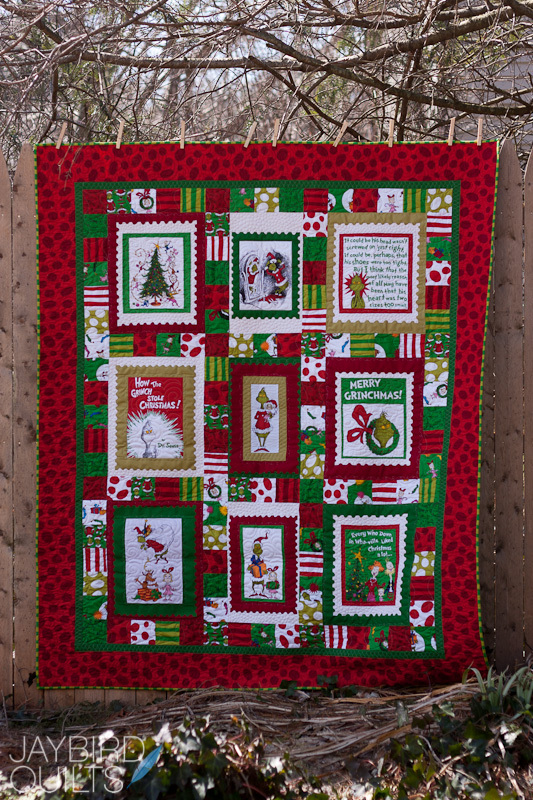 The answer is that the pattern was written this way to avoid having white appliqued on top of green or red. 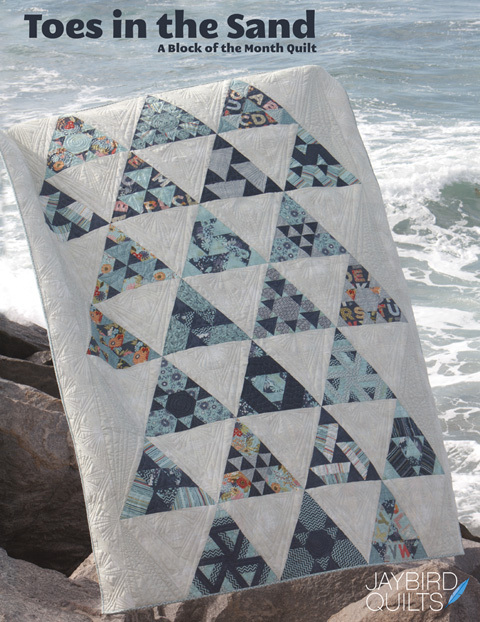 If the quilt was made this way you would have to add stabilizer or use more than one layer of fabric to avoid having the dark color show through. Finally I have received questions about the way the fussy cutting directions are listed. Some are listed width x height and some are listed height x width. This was not done to confuse you. 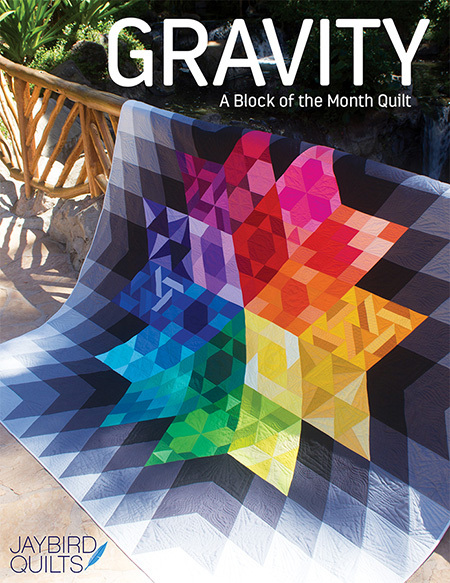 Clearly all of the blocks in the quilt are taller than they are wide. 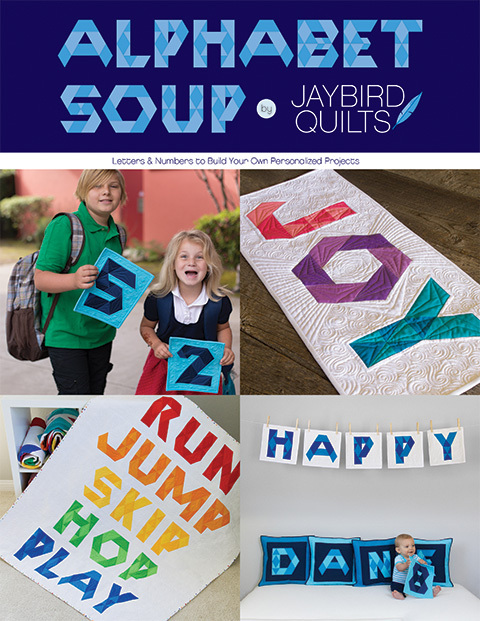 This was simply how we wrote the numbers down while making the quilt. I'm sorry for any confusion that this free pattern may have caused you. 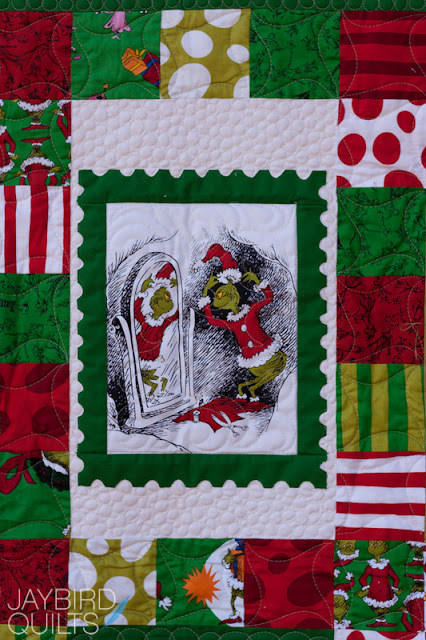 Please download the updated Merry Grinchmas free pattern before asking any questions. 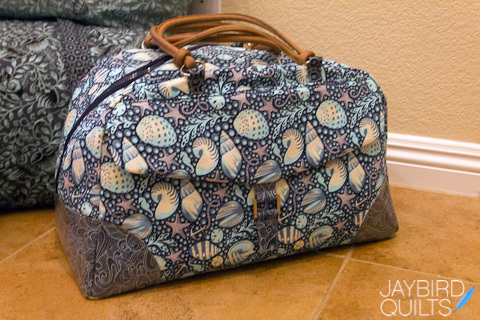 If you have additional questions after referencing the updated pattern please leave them in the comments section. 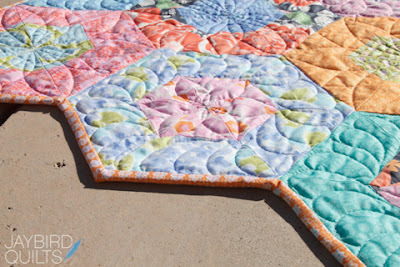 Quilt measures - 58" x 68"
Today I'm going to give you tips on how to bind the 120° hexagon edges of a quilt! 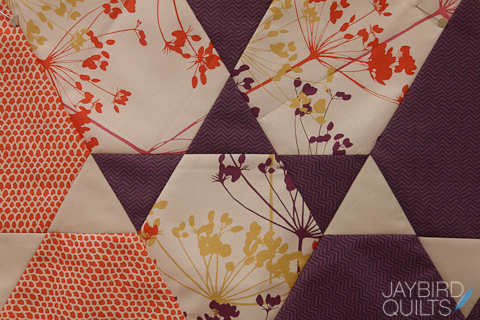 Binding hexagon edges may seem hard... but it isn't! It can be a fun way to finish a quilt. 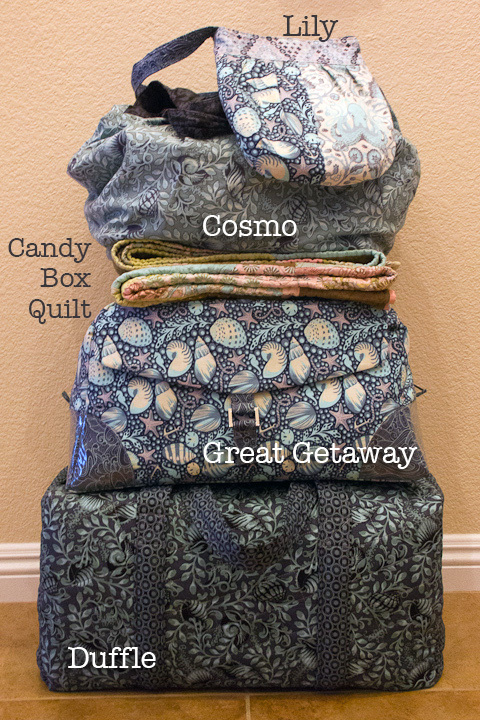 I used this technique with my Science Fair quilts. 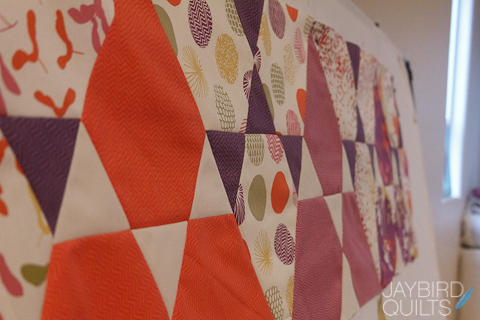 ...and with my recent Junior Ballerina quilt that I made for Jonah. 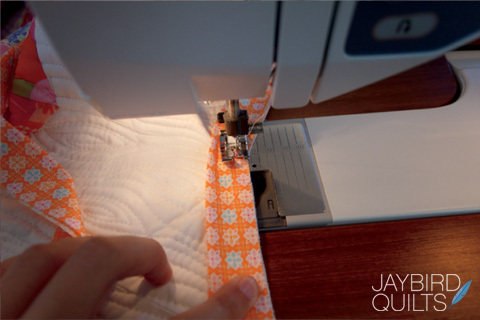 First you will need to create your binding. I highly suggest Bias Binding for working around Hexagon Edges. 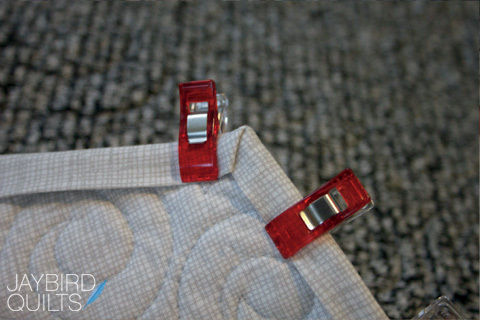 Bias binding is necessary to get a great finish around the 120° angles. 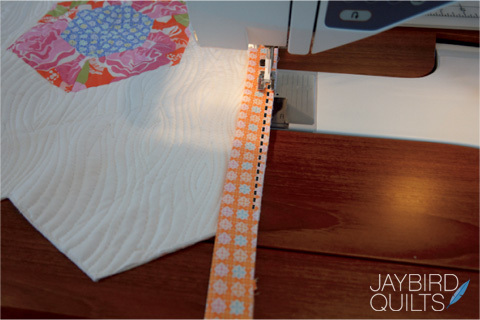 Make continuous bias binding or cut individual bias strips with a rotary cutter. 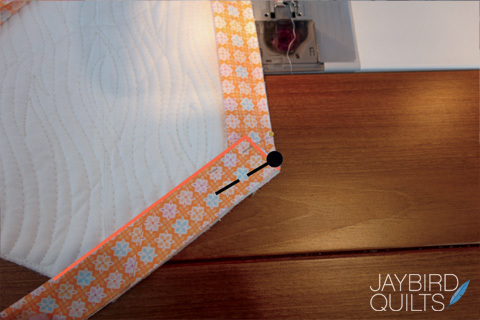 Complete Bias Binding directions can be found in the previous Bias Binding tutorial. 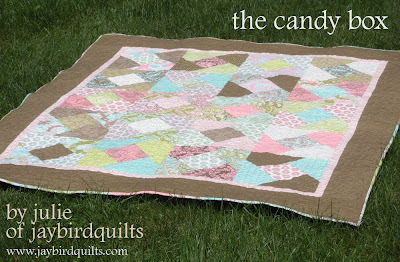 -- Note: The angles of the quilt shown in this tutorial are 120° angles. This method will work with other angles between 90° and 180°. 1. 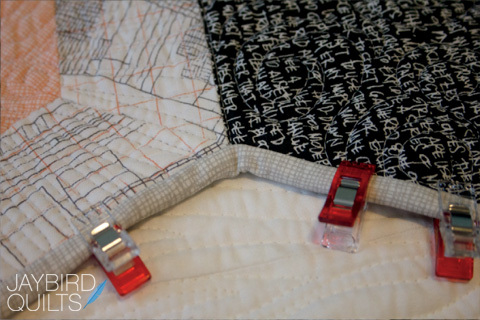 Begin by sewing binding along one of the straight sides of the quilt with a ¼” seam allowance. Stop sewing ¼” from edge of quilt top and backstitch. 3. 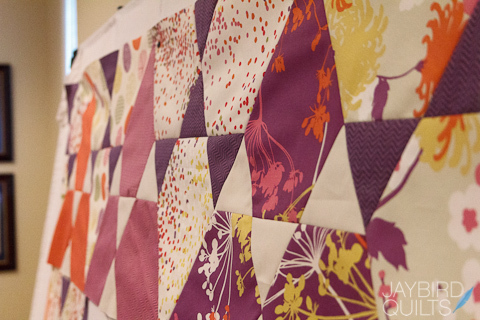 Fold binding back over and align with the edge of the quilt top. Pin in place. 4. Repeat steps 1-3 for all convex angles. 5. Cut into quilt top 1/8” at each concave angle. 6. 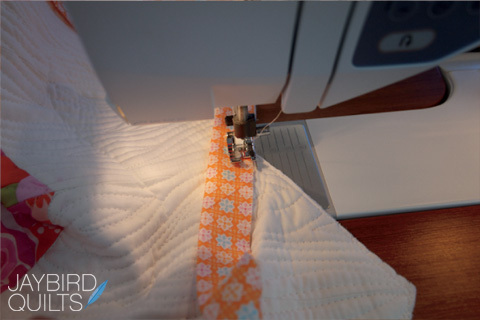 Stitch binding in place until you get to the center of the angle. 7. 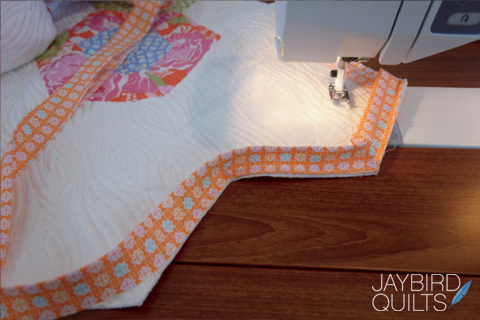 Leave your needle down and pivot the quilt top 30° until the next section is straight in front of you. 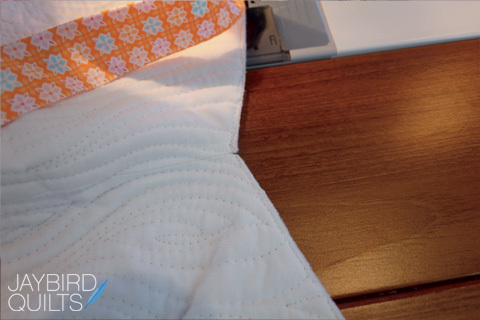 Ease the binding around and continue sewing the binding in place. 8. 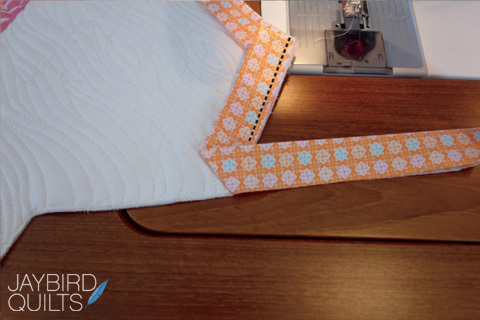 The binding at the Concave angles will stick up until it is hand stitched in place on the back. 9. 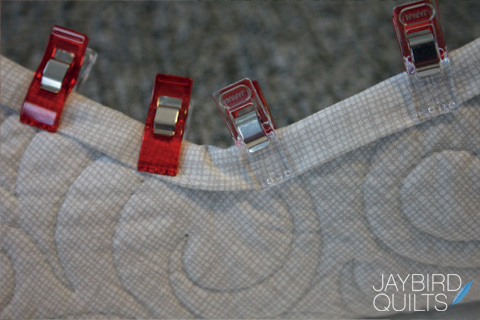 Use Clover Wonder clips or other binding clips to wrap the binding around to the back. Miter the convex angles. 10. 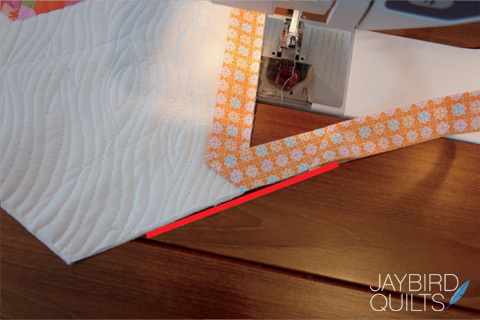 Ease the bias binding around at the concave angles and clip in place. 11. 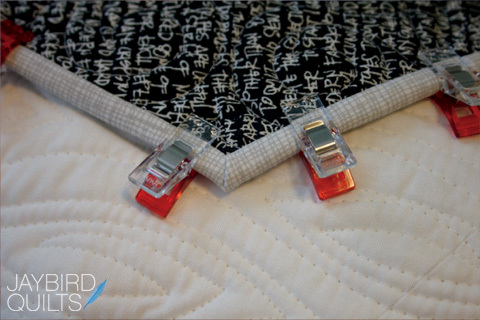 Hand stitch binding in place to finish your quilt! Here is a button you can use. 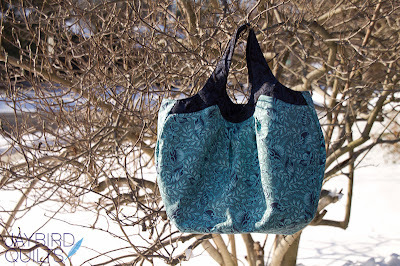 Additional binding tutorials and other free tutorials can be found here.